Particularly around a doorway, it is important for rain water to be quickly directed into the façade drainage channel (photo: FTR with grill cover) in order to prevent water penetrating the building. The filigree balcony and terrace drainage channel BTR in stainless steel with long slots is frequently used in high-grade entrance areas. A terrace grill is integrated into the slabs, directly over the roof outlet, allowing for easy monitoring and maintenance of the outlet at all times. 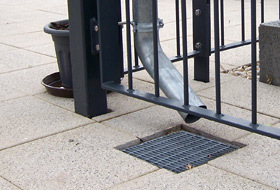 In areas with a high incidence of water, for example here beneath the down pipe, terrace grills are an important factor in a well-functioning drainage system. 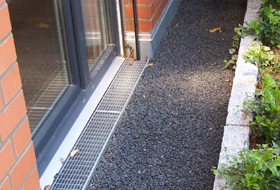 Controlling drainage on roofs, terraces and balconies is vitally important, especially if the surface covering is unable to sufficiently absorb the falling rain water. An enormous amount of water from driving rain can fall in a short space of time, particularly at the base of façades or other vertical surface areas. This water has to be run off without delay. The build-up of snowdrifts, slush and ice also has to be taken into consideration in terms of the actual transfer of damp and water. As is the case with wind direction, the intensity of rain and snowfall depends on the region in which the building work is being carried out and on any protection elements present, e.g. an overhanging roof. Suitable structural solutions are required for all connection and end points on a roof in order to prevent water logging. With its comprehensive range of drainage channels and grills, ZinCo provides permanent and reliable solutions for all roof situations. The most important factors for an effective drainage channel are its location and size, the opening cross-section of the cover and of the channel body and the installation position. 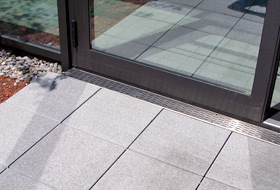 Typically installed against a façade or door threshold, any excess water from above is absorbed immediately and quickly into the channel body. The slots at the bottom of the channel body enable the water to seep into the drainage layer below and then to the roof outlets, which can be at some distance depending on the individual roof layout. ZinCo offers a wide range of drainage channels to suit various building circumstances and to meet different visual requirements. ZinCo FTR façade and terrace drainage channels are made of aluminium and are 100 cm long and 15 cm wide. They are infinitely height adjustable from 55 to 75 mm or from 75 to 100 mm to suit all connection heights. They have either a visually appealing aluminium cover with oblong slots or a grill cover that increases the water uptake capacity. In comparison, the BTR balcony and terrace drainage channels are the “filigree” channels, at only 10 cm wide and are infinitely height adjustable between 40 and 55 mm. They are made entirely of stainless steel and have visually appealing oblong slots. They are typically installed in high-grade entrance areas. FR façade and terrace drainage channels with a fixed height of 50 or 75 mm are known as the “classics”. At a width of 15 cm, these drainage channels are available in lengths of 100 cm, 200 cm and 300 cm and also as length adjustable channels (FR Vario). They are made of galvanized, plastic-coated steel and have a grill covering. Terrace grills are used where a roof outlet is located beneath floor covering. Installing the grill directly over a roof outlet allows for easy monitoring and maintenance of the outlet. In areas with typically high levels of rain water, a grill is also a good solution, for example beneath down pipes, as the water can be quickly absorbed and directed away. ZinCo TR-H terrace grills are available in the dimensions 20 x 40 cm, 40 x 40 cm or 50 x 50 cm and are infinitely height adjustable between 65 and 95 mm or 95 and 125 mm. A height of 175 mm can be achieved with the appropriate extension piece. In addition, ZinCo produces a terrace grill TR-F with a fixed height of either 40 or 50 mm, suitable for standard slab thicknesses. Where required, BES drainage shafts that are suitable for vehicular traffic can be installed over a roof outlet, for example, in the floor covering of an underground garage roof. ZinCo provides reliable solutions for all roof situations, tailored to suit the building.